Happy Kitchen Sink Monday, I hope you had a great weekend! I used MJ's Sketch 85 for my inspiration, rotating the sketch, and adding the sentiment Sweet Birthday Wishes in place of the brads. 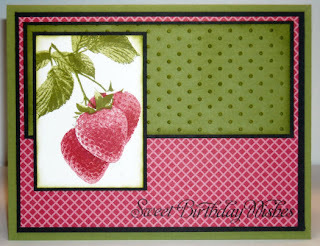 All images are from Kitchen Sink Stamps Multi Step Berries. To create the focal image, I stamped as follows: Stem Step 2 in Old Olive, Step 1 Old Olive stamped off; Leaves - Step 3 Old Olive, Step 2 Old Olive, Step 1 Old Olive stamped off; Berries - Step 4 Riding Hood Red, Step 3 Riding Hood Red, Step 2 Riding Hood Red stamped off, Step 1 Riding Hood Red stamped off. I stamped the third berry on scratch paper, added the stems (Step 3 Old Olive, Step 2 Old Olive, Step 3 Old Olive stamped off), cut it out then popped it up on a dimensional. The edges of the panel are sponged in Old Olive, then layered on a Black panel. The Olive panel behind my image was run through the Big Shot using the Swiss Dots Cuttlebug Folder. TIP - remember to spritz your card stock lightly with water for a deeper embossed image. After embossing, I used the CuttleBug Highlights to add color to the embossing, and sponged the edges. I just LOVE this card. I'd never heard of Kitchen Sink stamps before following your blog, now I think I need to put an order in with them. Your work is truely inspirational, thanks! Love this gorgeous birthday card, Lisa!! Beautiful shadows on these perfectly masked berries!! Great colors and designer papers to showcase these stunning images!! Haven't had breakfast yet...so now I want strawberries with whipped cream and dark chocolate! mmmmmm-berry beautiful GF! Lisa, this is such a pretty card...love your coloring as well...cannot wait to meet you real soon at the KSS camp! Very pretty, I love those colors together!!! Nice change to the layout. Great card, very pretty! Love the sentiment. Wow!! This is gorgeous, Lisa!! Your strawberries look so real!! Thanks for sharing your talent, too!! Beautiful, Lisa!! Love all the dimension to this card! Oh my gosh, these look just like a picture. Amazing how great these stamps look! Thanks so much for playing along--EVERY week, lol. Such a gorgeous card Lisa! What perfect colors and patterns you chose. I love everything about this card. So "berry" cute! n't git how you did that lisa but it looks like a photo, nice work! What a great summer birthday card, Lisa! Oh so pretty!! Love the pink-ish berries - such a nice change!